Singapore had been a center of interest for the bands playing within the heavy metal genre in Asian continent. With a strong promotional background, many Singaporean acts and festivals had gain acceptance to a larger crowd! Can this be calculated as a threat to underground? Well, this is a topic to keep debating on. But to reincarnate the steadfast underground spirit, two promoters Shaiful and Mike teamed up for “SCREAMS FROM THE MORGUE”- a true underground show comprising of 6 bands only. All of the acts to play in the concert are from different countries but Singapore. The reason behind putting a show without bands from Singapore, the organizer Mike urged the showcasing of performance by the overseas bands, how they made impacts on their respective metal scenario. This also aims at the betterment of the young Singaporean acts by converging a variation of metal acts having different tradition but playing the same filthy form of music. With a show like this one, the invited bands also get the chance to share the stage before Singahellian chaos worshippers with their music and merchandising!! This is the uniqueness of this concert according to the organizers. Having it as the first onslaught from the SCREAMS FROM THE MORGUE, the organizers also expect to have future concerts with bigger arrangements. 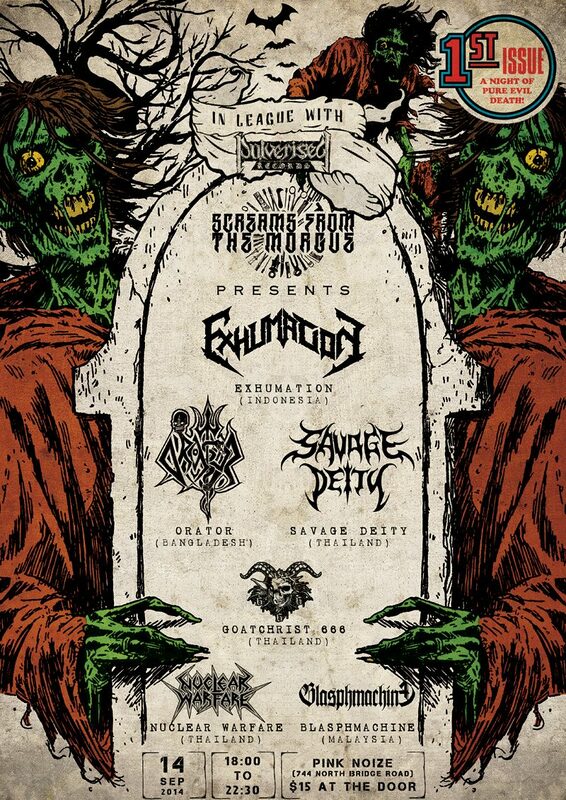 The six bands confirmed to play in the show are: Exhumation (Death metal, Indonesia), Orator (Death/Thrash metal, Bangladesh), Savage Deity (Death metal, Thailand), Goatchrist 666 (Black/Death metal, Thailand), Nuclear Warfare (Thrash metal, Thailand) and Blasphmachine (Black/Death metal, Malaysia). The confirmed date for the gig is set to 14th September,2014 at Pink Noize (744, North Bridge Road), Singapore City. The gig is to be co-sponsored by Pulverised Records.